Smart Tone. Brilliant Pedals. | Austin, TX. Why and when to use a guitar buffer. Ships in 8 Weeks. Please email for current wait. Backorder - please email to be placed on wait list. How to use a Credit Card Instead of a Paypal Account. New Sept 2015! 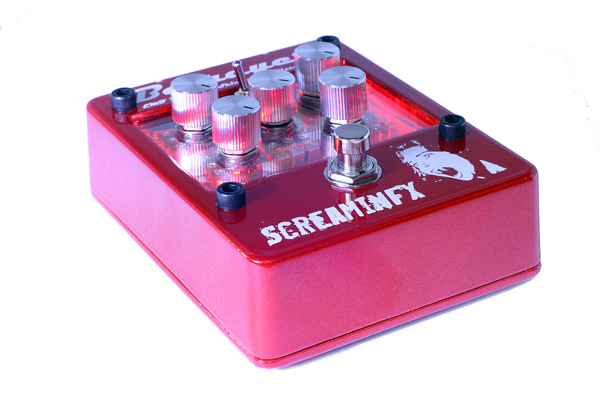 Screamin’ distortion - want a clue for the style - it’s going to ’betray’ you out! For guitarists looking for a distortion that isn’t afraid to be aggressive, the Betrayer brings to perfection mid to high gain distortion offering an extremely wide range of options for your heavier sonic pleasures. It is based on a 308 opamp style gain stage and clipped by 3 diode choices (not just one like many others of this style) so you can choose between different voicings for that perfect harmonic bliss - vintage dark, open circuit and tight metal with the mode switch. It uses a secret opamp that has amazing tone for this pedal. You can even see it, the black little chip right in the center of it all. Dial in the exact tone you want. 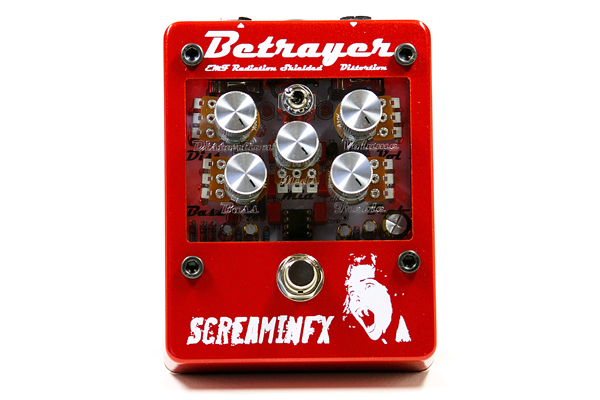 The Betrayer has an extremely versatile 3 stage passive tone control with bass, mid and treble adjustments allowing you to dial in any tone. Have a huge presence, scoop the mids or dial in any sound you want. A pick sensitive, expressive distortion. It is extremely pick sensitive which means your playing style and feel come through. First, set it right at the edge of full on distortion. Then, when you strum lightly, you’ll have a nice crunch but when you really rip into it and dig on the strings, watch out, full on distorted glory! Maintain stage volume with a built in boost stage. I hate when you stomp on a pedal and it’s quieter than my clean sound. This will never happen with the Betrayer because the output is actually a booster stage which will make sure that when you turn it on, it is never quieter than you clean sound. You can dial the distortion back, turn the boost up and end up with some really nice overdriven sounds. Designed to work well with other pedals. This pedal was designed to work with the other pedals on your board. It is true bypass, but there is a buffer on the input when it is live which means you can put pedals such as a wah in front or active pickups and get amazing sweep out of it. The inner stages are impedance matched providing the best possible tone. The output has a low impedance which means you won’t suffer tonal loss driving the next pedal or your cables to your amp. See all the components and tone in the making. The Betrayer has a transparent panel on the front that enables you to see the tone making guts! It is patent pending and has a metal EMF radiation shield (look closely, you’ll see a grid under the clear part). Although the looks blow you away, wait until you hear it plugged in. The Betrayer is engineered with the pro guitarist in mind. Sure, it has a cool transparent top but the reason is so that you can get a glimpse of all the details on the inside. The circuit board is designed using low noise principals often reserved for expensive RF equipment. Wire lengths are minimized and barely used at all. This means that it is a very quiet pedal for a distortion of this type. It is extremely low power, only requiring 6mA from a 9V battery which means batteries last a long time or it will barely load your fancy power supply. High quality parts including audio grade capacitors, metal film resistors and aluminum knobs all accent the look and sound of the design. Forgot to mention – absolutely insane new look that will light up your pedal board. See all the tone making glory in the actual pedal. Go ahead, take a picture. Be transparent. 3 stage passive tone control with bass, mid and treble adjustments allow you to dial in any tone. Extremely versatile. Completely analog design with low transistor count to maintain transparency of tone. Boost stage of up to 4dB maintains stage volume. LED indicator makes the insides glow when pedal is on. True Bypass input and output (Will not load other pedals when off). Powder coated enclosure with screen printed graphics. Draws <6mA current when on. What is the story behind the Betrayer Distortion? I wanted a pedal that could not only scream out classic distorted tones but also fit right in with some really heavy metal. This led to the addition of a tone stack to a traditionally styled opamp clipping diode distortion pedal. The tone stack enables the adjustment of the EQ which really affects the final sound of the pedal. I also like really dark, moody tones so I decided to make several clipping options with one of them extra dark. With no diodes in the middle, it has a great classic rock crunch while the third setting bleeds through more highs for a really tight sound. I made up a great boost circuit that adds a little more depth to the pedal in addition to giving it a volume boost. Finally, I wanted a new look to guitar pedals and came up with a method to show all the inner guts without having noise problems. In addition to being a showpiece on your pedalboard, it’s sound should blow you away. 60 Day No Hassle Money Back! You need to try the pedals on your rig at home or on stage. If you buy one and it is not for you, please send it back unharmed and I will refund the purchase price no problem. I ship internationally all the time and am becoming somewhat expert at it now. I have sent pedals everywhere! However, it costs more to ship internationally. The added cost for shipping this pedal internationally USPS first class is added in when you check out and is based on weight. This first class shipping takes about 3-4 weeks and depends on customs in your country. There is also a priority option, please email me but this is usually at least $40 and the pedal will arrive in 6-10 business days. If you have any questions or concerns please email me using the contact form. I will let you know immediately if the pedal you order is not in stock. I usually try to have several ready to go, but please remember that I build each one by hand which can take me a while if I have a long list or if my kid is extra fussy. Then I test them to make sure they are exactly how I want. The hardest part is not rocking out for a long time when I test them! All pedals have a 3 year warranty from date of purchase and transfer to whoever owns the pedal at the time. If you sell it sometime in those first 3 years (hopefully never! ), you can tell them it is still under warranty. Very striking looking, uniquely voiced mid to high gain distortion pedal with a lot of unique and very intuitive features. It is a very quiet pedal, even at the higher gain settings. At the lower gain settings, a kind of thickness and nasty doomish qualities that sometimes are hard to get out of this type of distortion pedal. What you'll notice, very interactive and much more in a way of range of tones and dynamic ranges than you might expect. Really nice Marshall-esque mid upper presence, as you bring up the low end it doesn't get muddy, just more thick and solid on the low end. Very versatile, leaning towards a mid to higher gain Marshall JCM style tones with an aggressive cut to the attack that is really musical and compelling. Quite simple and to the point. It's definitely its own thing! Videos Artists Made - Let me know if you make one and I can post it! 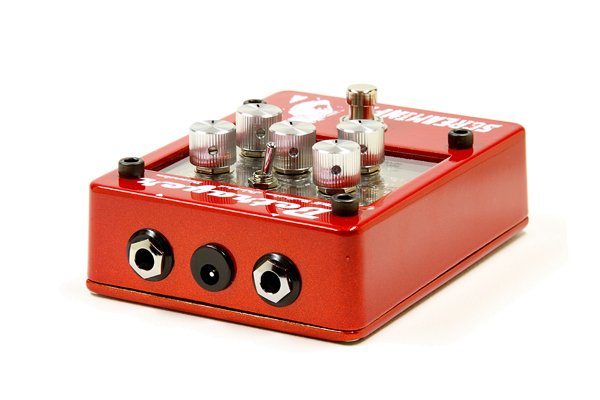 Spring reverb pedal that has a real tank inside for big TRUE REVERB sounds. Can overdrive your signal and go completely Wet for an immersive experience. Tuned silicon fuzz I designed starting with a basic Fuzz Face and de-tuned to be more useable. Classic sounding fuzz with built in buffer to work well with a wah-wah pedal first. I hand match Germanium transistors and then put them in a fuzz tester I designed which allows me to customize the bias networks. 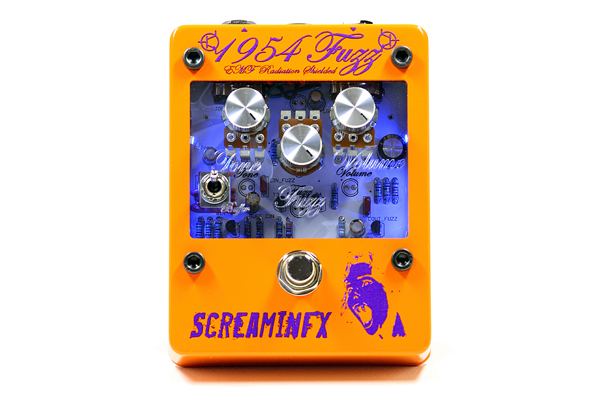 When it is done, the 1948 is one of the best sounding fuzz pedals you will hear. It has a buffer that can by bypassed if you want to use a wah first. 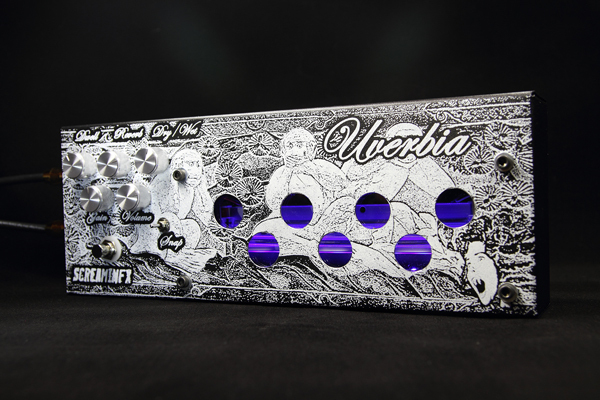 I just designed a new, real spring, reverb pedal called the Uverbia. Based on this, I wrote an article talking about spring reverb pedals compared to digital reverb pedals. This is a really detailed article with everything you need to know about guitar buffer pedals. Where to put them and how they work. It talks about why you want high input impedance and low output impedance. Here are a bunch of tips and tricks I learned over the years on how to get the most out of your fuzz pedal.